Getting organic traffic to your website is something that is becoming increasingly difficult as competition intensifies. Webmasters are looking for several organic ways to bring more traffic to their website. This is because the more people visit your website, the more your brand gets noticed. If you are looking to learn how to get organic traffic to your website in 2018, mainly if in you are located in Seattle WA then here are useful tips for you. The social media today drive over 40% of all traffic to websites. This means that as a business owner who owns a website should spend a significant amount of time and money in linking the website to multiple social media platforms. This will increase your social presence and improve the number of users who visit your website from social media. Luckily, there are plenty of quality social media sites which make it a lot easier to find the ones that fit the niche of your business. The three most important social media are Facebook, Instagram, and Twitter as they have millions of active users who uses these social sites on a daily basis. Creative content is something that forces users to visit your website again and again. Having fresh content encourages users to read more and more content on your website. Thus, helps in improve bounce rate of your website. Ultimately, it means to grow your website's traffic it is a necessity to write creative and highest quality content. Nowadays, people love to share content with their friends and family. Quality and unique content automatically force people to share it on their social media. The more the content is shared across social media websites, the more traffic it will bring to your websites. Users today are looking for websites which are engaging and are encourages user-generated content. Engaging content allows people to share comments, share them on social media or have their input on the website content. Engaging with your users can be done by adding chat functionality to the website. By doing so, webmasters can interact with users and learn about their suggestions and complains. Your website will grow at a high pace if you follow the footsteps of successful businesses, especially those which are similar to your niche. By following other websites, you will be able to learn new methods of engaging users especially by reading daily blogs. 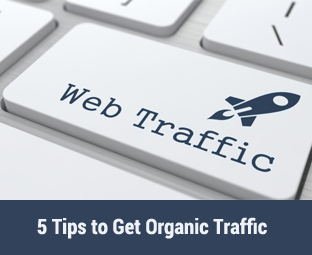 We hope these quick 5 tips will help you in getting more organic traffic to your website. If you have a secret tip to improve organic traffic, then feel free to share them in comments below.